Quantifying the success of any digital marketing campaign can be difficult at times, particularly when trying to connect your efforts on the Internet to brick and mortar sales numbers. When you consider 94% of retail business is still conducted offline, however, that data is not only useful but essential in determining what your online advertising budget should be. Even if you’re not paying to promote Tweets, the fact that you’re putting your brand out in front of Twitter users is making a difference, especially you’re doing so frequently. As perhaps to be expected, promoted Tweets make an impact too. According to the study, Promoted Tweets translate into a 12% average sales boost for the product in question among users who engage with your Tweet. Even for those users who don’t engage but just see it, 2% more are likely to purchase as a result anyway. The conclusion? Tweets make a significant difference in how people shop. A social media presence in the virtual world still counts for any brand interested in conversions for the real world too. 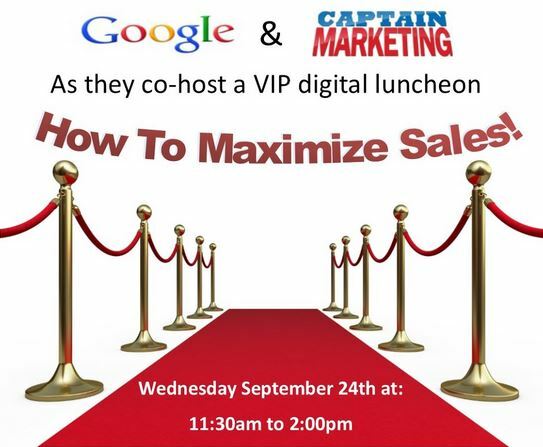 In an invitation to any business interested in improving overall sales and boosting the impact of their digital “footprint,” Google Partner, and online marketing company Captain Marketing is hosting a VIP luncheon on September 24th at Google headquarters in Venice, California. While the event is free, a reservation is required, along with an RSVP. Many of us are still resisting using Google+ socially. Most people barely have time for Facebook, let alone another social media platform. And when it comes to business, who cares, anyway? Aren’t Facebook and Twitter enough? Google+ posts also send valuable social signals to the indexing bots, another key element of today’s search engine optimization process. As you post images, blog links and text to your Google+ page, you’re letting the search engines know your relevance to the goods and services you sell. Testimonials and reviews posted on this social media platform will also help you gain traction. Google+ is free, fast and easy, and it will help a lot. In the sometimes complicated world of digital marketing, there aren’t many strategies you can unequivocally describe in the same terms. Move ahead of your competitors and take advantage of Google+ benefits today. And who knows? Maybe you’ll find time to create your own personal Google+ page as well. Christmas Eve brought a sad call to Michigan’s Benzie County Animal Control when a Good Samaritan reported finding a stray puppy in the snow with not one, but two broken legs. With a choke chain around his neck but no identifying tags, the dog was immediately treated for pain and held at the shelter until a solution could be found. Luckily, animal control worker Ed Carter and his wife took pity on the suffering animal, who would need extensive-and expensive-surgery to fix his badly injured legs. He brought the dog to Bay Area Pet Hospital, where they not only took X-rays free of charge, but posted on their Facebook page about the case. The story quickly went viral on the social media platform, and response was immediate and definitive. Donations to the small, regional animal hospital poured in from places as far away as Washington DC and Alabama to cover the cost of the stray’s surgery and rehabilitation, and the beagle mix is expected to make a full recovery. A LinkedIn’s senior vice president announced in a recent blog post that the popular social media platform now enjoys a membership of 200 million people worldwide, with new users joining the site at a rate of two per second. In addition, he reported that the three most followed members of the site include Richard Branson, Barack Obama and Deepak Chopra. Founded in 2003 as a networking site for professionals, the site is available in 19 languages, and utilized by people in 200 countries across the globe, with half its members located in the United States alone. LinkedIn is a publically traded company, with revenues in excess of $252 million as of tax filings issued at the end of 2012. Twitter The Next Big Thing on Nasdaq? In news not so surprising, perhaps…Twitter has been recently valued at potentially $11 billion dollars by analysts who also predict a public offering in 18-24 months. Financial researchers at Greencrest Capital released the report that triggered speculation that plans to take the company public may be announced shortly. With hiring at Twitter focusing on new management and the company’s recent efforts to monetize their services through products like promoted tweets, et al, some pundits and various financial sources feel the move is not only inevitable, but imminent. Mashable.com, the online tech news site, has announced the top 10 most influential people on Facebook for 2012, and their choices may surprise you. First on the list is George Takei, the retired actor who once played Officer Sulu on the television show “Star Trek”. Now a popular social pundit with daily Facebook status updates and commentary, he enjoys millions of subscribers who regularly repost his witticisms to a larger audience. President Obama was named the second most influential Facebooker of the year, with 34 million likes to his official Facebook page alone. Indeed, his candidacy was marked by a sophisticated use of social media and pay per click ads that far outpaced the tech savvy of his competitors. Among the others listed for the year as the most powerful members of the social media platform: Governor Mike Huckabee, blogger Richard Metzger, and you, the average Facebook user, who helped to make Facebook 1 billion strong in 2012 and a social force to be reckoned with for years to come.